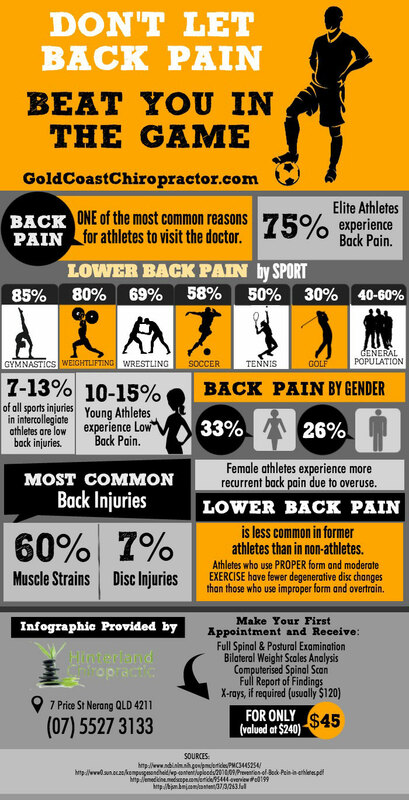 Back Pain is one of the most common reasons for athletes to visit the doctor. 75% of Elite Athletes experience back pain. 7-13% of all sports injuries in intercollegiate athletes are low back injuries. 10-15% young athletes experience low back pain. Female athletes experience more recurrent back pain due to overuse. Lower back pain is less common in former athletes than in non-athletes. Athletes who use proper form and moderate exercise have fewer degenerative disc changes than those who use improper form and overtrain. Win the game against back pain. Visit your chiropractor Gold Coast at Hinterland Chiropractic for a revitalizing chiropractic care. For more information about chiropractic care, call us on (07) 5527 3133 or book your initial chiropractic consultation online.